Fit-Ink: How Many Hours 'Til the Army 10-Miler Closes? There's something that fascinates me about the Army Ten-Miler. It's not a hometown race. It starts near the Pentagon and offers a tour of Washington, D.C. It brings several speedy runners, including those in the military, and has Shadow Runs around the world so active-duty military can participate. It's usually on my friend's race calendar and she's invited me to run it on more than one occasion (race conflicts, travel logistics, injuries and lack of entries have kept me off the course). But that's it: I'm intrigued because I have yet to run it, 8 years after I first tried and failed because I was an hour too late to the registration portal. The Army Ten-Miler is one of the District's most popular races and with its 30,000 runners, it's earned the distinction of being the third largest 10-mile race in the world and the U.S. Army's premier event (according to this 2010 information). But those 30,000 spots go fast. They were gone in 6 days in 2009, 35 hours in 2010 and then had a new registration process in 2011 that didn't make these bibs quite as hard to come by. Question is: how quickly will those spots disappear in 2012? Registration for the October 21 race opened at midnight eastern time on Tuesday, May 15, and six hours or so later, more than 21,000 spots were already claimed. I actually thought more would be taken, but when the October 28 Marine Corps Marathon registration closed in two hours, I can only assume that all of D.C. is running that and not using the Army 10-Miler as a shake-out dress rehearsal. 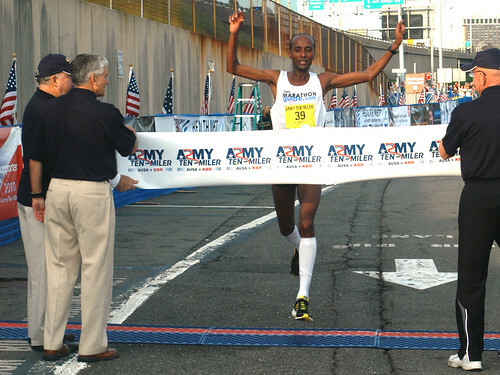 We'd love to hear your best guess as to when the 2012 Army Ten-Miler will shut down registration. Will the remaining 8,000-plus slots be gone before the day is out? Photo grabbed from US Army Africa at flickr, taken by Steve Sanderson, U.S. Army Africa Public Affairs. It's closed at 9:15! One day we'll get you out here to hoo-ah through 10 miles and see someone jump out a plane/helicopter (can't remember which) to start a race! PS One of my favorite aspects of this race is the competition between all the foreign militaries. I think the Brazilians usually win. Check last year's results - there were like 5 of them in the top 15. Add the person jumping out of a plane/helicopter to my reasons for why this race fascinates me! I'll definitely get out and run it one of these years, just not two weeks after the marathon ;) I called it on closing at 9, figuring people would get to their desks and steal the last hundred spots. I was reading about some of those competitions while looking for a picture to post. While on a much smaller scale, it sounds a little like the team racing that happened at a 5K I ran last weekend for the Chicago Police Memorial Foundation. The SWAT team won; they just looked fast!